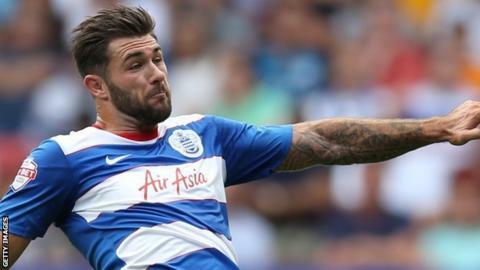 Charlie Austin signed a three-year deal when he joined QPR from Burnley in 2013. Striker Charlie Austin believes staying at QPR has cost him his England place, but is determined to help them win promotion from the Championship. Austin scored 18 Premier League goals last season to earn an England call-up, but Rangers were relegated. The 26-year-old says it is probable he will not be in the squad for the 2016 European Championships as a result. "The move was not right for me in the summer, I decided to stay at QPR," he told BBC Wiltshire. "Of course you have ambitions, but I have to be realistic and take it one step at a time." "I know the Euros are at the end of the season but the likelihood now is that I'm not going to be involved in that squad." Former Burnley and Swindon forward Austin has continued in the same scoring form this season and already has seven goals. And he believes that Chris Ramsey's side should be in the top six come the end of the term." "That does not mean that I am not going to try and score as many goals as I can for QPR because our main aim is to get promoted." Austin added that despite his successful debut season in the Premier League and call-up by national team boss Roy Hodgson, he still did not feel he had reached his peak. "When I got into the England squad, I did not think I had made it. It made me realise what the top players do," he said. "The likes of Rooney, Wilshere, Henderson, Cahill - you see the way they train and it makes you realise you have to be at it every time you cross that white line. "The Premier League it is what I expected and more. You are surrounded by world-class players, quality players. The one thing I learned is you get chances in the Premier League, but you have to take them. The Premier League was deadly, half a chance and it goes in." Austin said transfer speculation had not been a distraction, adding: "In the summer, I knew I had to get my head down and work as hard as I could and if it happened, it happened. "I always said if it was right for me and my family I would have moved."